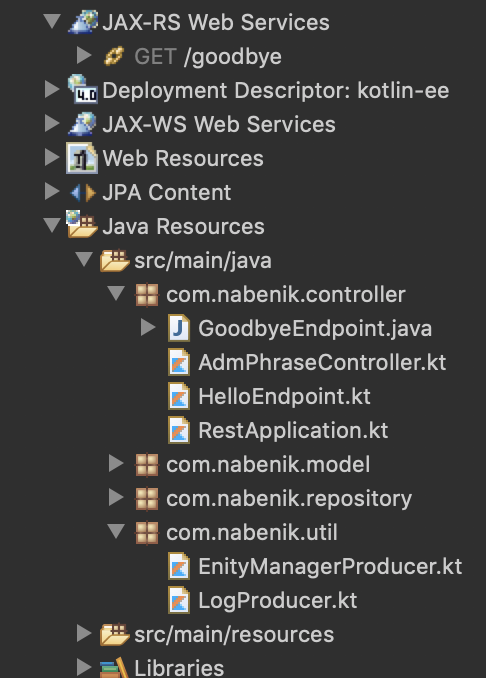 Kotlin works as language and plays well with Maven, I’m able to use many of the EE API for “services”, however the roadblock is not the language or libraries, is the tooling support. 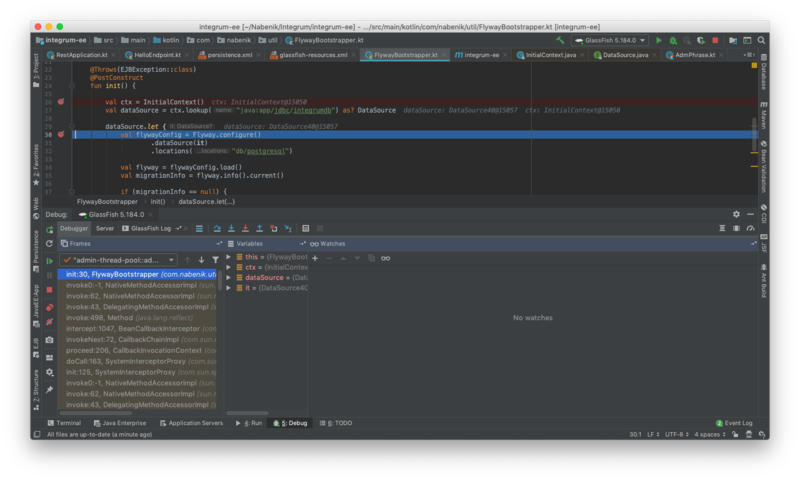 The experience is superb on IntelliJ IDEA and all works as expected, however the IDE is a barrier if you’re not an IntelliJ user, Kotlin doesn’t play well with WTP on Eclipse (hence it doesn’t deploy to app servers) and Kotlin support for Netbeans is mostly dead. To enable Kotlin support I basically followed Kotlin’s Maven guide, is not so explanatory but if you have a litle bit of experience in maven this won’t be a problem. 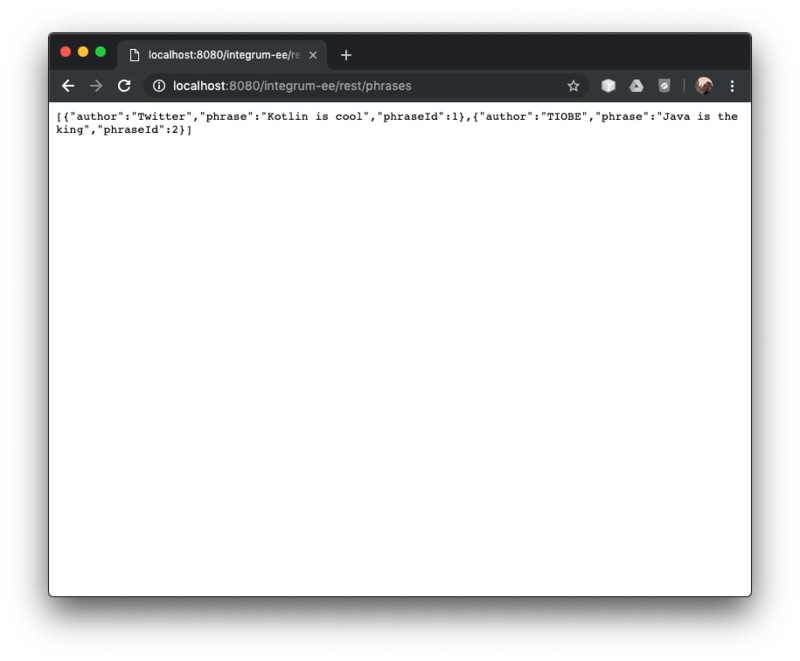 Besides adding Kotlin dependencies to a regular EE pom.xmla special configuration is needed for the all-open plugin, Jakarta EE works with proxy entities that inherit from your original code. To make it simple all CDI, EJB and JAX-RS important annotations were included as “open activators”. Table models are easily created by using Kotlin’s Data Classes, note the default values on parameters and nullable types for autogenerated values, using an incrementable value on a table. After that, I need to provide also a repository, the repository is a classic CRUD component injectable with CDI, one line methods are created to make the repository concise. The interesting part however is that Kotlin’s nullability system plays well with CDI by using lateinit. To create a real test, four “advanced components” were included, being an entity manager producer for CDI components, a Flyway bootstrapper with @Startup EJB, a Log producer for SL4J, and a “simple” test with Arquillian. 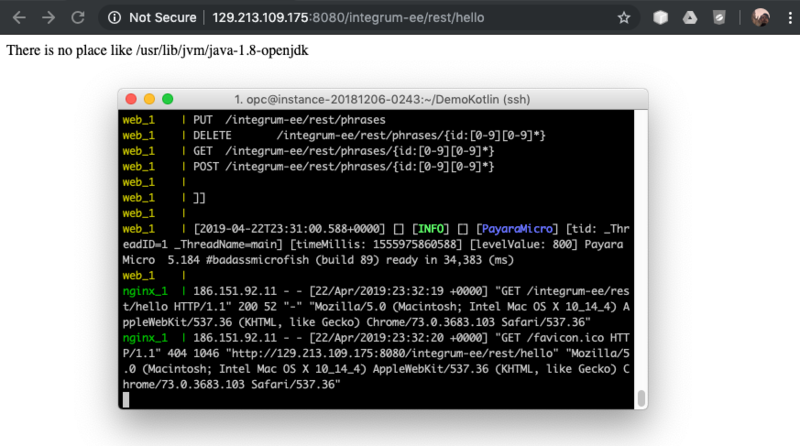 The Flyway migration is implemented with EJB to fire it every time that this application is deployed (and of course to test EJB). Since Kotlin doesn’t have a try-with-resources structure the resource management is implemented with a let block, making it really readable. Besides this if there is a problem the data source it will be null and let block won’t be executed. Finally a test class is also implemented, since Kotlin doesn’t have static methods a companion object with @JvmStatic annotation is created on the class, otherwise test won’t be executed. This is probably one of the examples where Kotlin’s program get bigger if compared to Java equivalent. 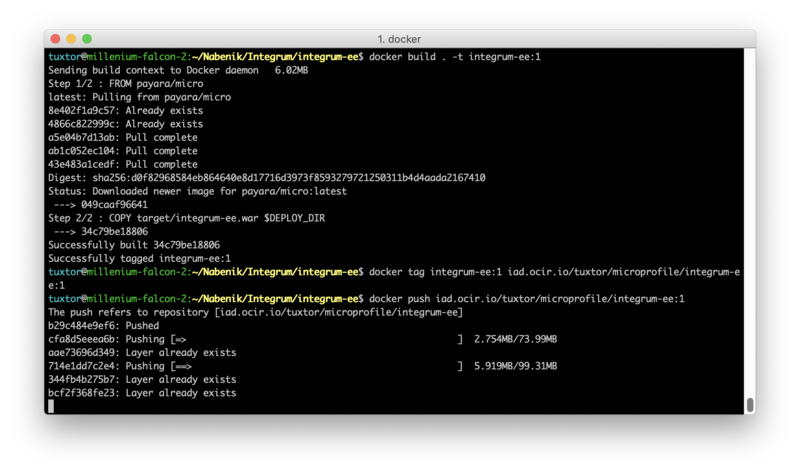 Once the container is available at Oracle Cloud the image become usable for any kind of orchestation, for simplicity I’m running directly the compose file over a bare CentOS VM image (the Wercker+Docker+Kubernetes is an entirely different tutorial). 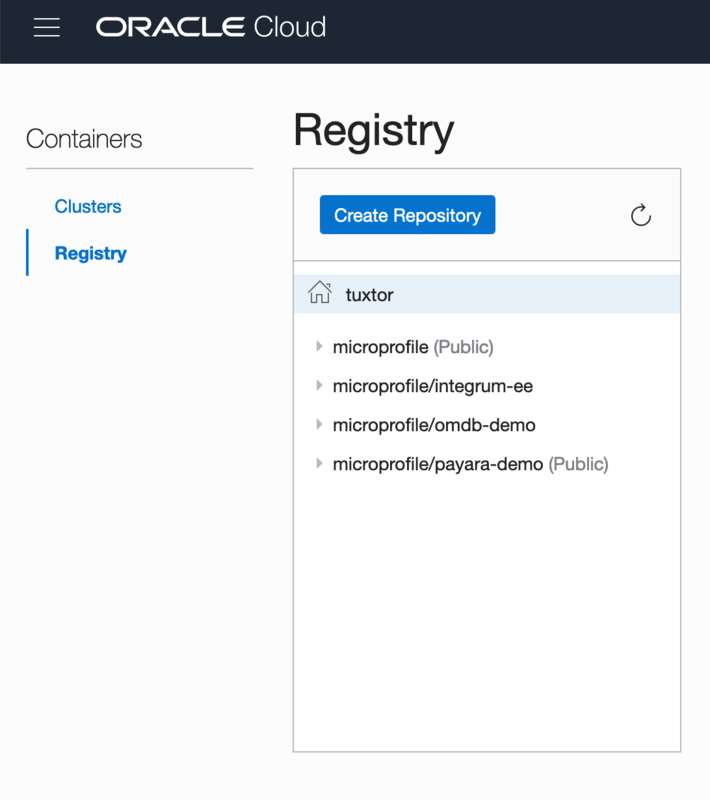 To use it on Oracle’s infrasctructure, the image ID should be switched to the full name image: iad.ocir.io/tuxtor/microprofile/integrum-ee:1, in the end the image is pulled, and the final result is our Kotlin EE application running over Oracle Cloud. Besides that, Jakarta EE complements/parsers work over the code and not the class files, hence the “advanced” menus don’t show content, a very cosmetic detail anyway. If Kotlin sources are located under src/main/kotlin as suggested by JetBrains Maven guide, these are ignored by default. Hence, I took the easy road and moved all the code to src/main/java. However if you try to deploy the application it simply doesn’t work because Eclipse compiler does not produce the class file for Kotlin source files, a bug was raised in 2017 and many other users report issues with Tomcat and Wildfly. Basically Eclipse WTP is not compatible with Kotlin and deployment/debugging Kotlin code won’t work over an application server. At the end I was a little dissapointed, Kotlin has great potential for Jakarta EE but it works only if you use IntelliJ IDEA. I’m not sure about IntelliJ CE but as stated in JetBrains website, EE support is only included on Ultimate Edition, maybe this could be changed with more community involvemente but I’m not sure if this is the right direction considering project Amber. Disclaimer: I received this book as a collaboration with Manning and the author. Today one of my favourite open source projects got a major release, now under Apache Foundation, welcome back NetBeans!.